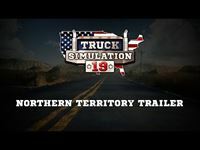 Moenchengladbach/Germany, February 06, 2019 – Since November 14, 2018 players of the new mobile game Truck Simulation 19 by astragon Entertainment and Jujubee are busy discovering the legendary US highways. Perfect for the current season now comes the first major content update, which will see virtual truckers dress up warmly to visit new territories located in the cold North of the US to expand their company and fulfil new missions. After downloading the new update, hard-working truckers will now be able to explore the Northern states of the US and expand their logistic company into the new region. This includes the iconic federal states Wisconsin, Minnesota, Montana, Wyoming as well as North and South Dakota. Here snowy highways as well as famous cities such as Minneapolis, Milwaukee or Bismarck already await the virtual haulers. In addition to the map extension, the content update introduces a new weather condition to Truck Simulation 19: For the first time, vast sections of the region will be covered by snow due to light snowfall, which can also develop to a thick flurry of snow. Truck fans can also look forward to brand-new story missions and the possibility to expand their business to new locations. The new Truck Simulation 19 update is available now as an automatic, free download in the Apple® App Store® and on Google Play®. The possession of the full version of Truck Simulation 19 is required. Truck Simulation 19 is available for iPhone® and iPad® in the Apple® App Store® for 3.99 Euro/2.99 USD/2.99 GBP (RRP). The game for smartphones and tablets using the Android™ operating system is available for free on Google Play® in a version of limited content. The full version can be unlocked at a price of 3.99 Euro/2.99 USD/2.99 GBP (RRP). © 2018 astragon Entertainment GmbH. © 2018, Jujubee S.A. Jujubee® and the Jujubee logo are registered trademarks of Jujubee S.A. Published and distributed by astragon Entertainment GmbH. Developed with the kind support of Kenworth Truck Company and AB Volvo Group. Manufactured under license of Kenworth Truck Company. KENWORTH and KW & Design Trademarks licensed by PACCAR Inc, Bellevue, Washington, U.S.A.. The MACK trademarks and designs are registered rights of the AB Volvo Group and are used pursuant to a license. Apple, the Apple logo, iPhone, iPad, and iPod touch are trademarks of Apple Inc., registered in the U.S. and other countries. App Store is a service mark of Apple Inc. Google Play and the Google Play logo are trademarks of Google Inc. All other registered trademarks or trademarks are property of their respective owners. Jujubee S.A. is a game development studio that has developed titles like "FLASHOUT 3D," "Suspect in Sight," "Take Off – The Flight Simulator," the real-time strategy game "Realpolitiks," and the upcoming documentary-adventure game "KURSK." The company's goal is to create inspiring and unconventional games for all significant device platforms, such as iOS (iPhone, iPod, iPad), Android, Mac, PC and consoles. Jujubee is a publicly traded company on NewConnect (JJB).